Meizu is a promising brand in the world of Android phone. The best part of Meizu phones are that they come with high-end specs but sold at pocket friendly budget, especially for MX 5 and Pro 5. According to an online survey, Most of Meizu phone users are very happy with their phones. However, there are problems with the phone sometimes if you deleted important data accidentally from your phone and unfortunately you just forgot to backup them? Actually, Meizu offers a free backup service called Flyme and you can check whether you backed up the data or not. Even without backup, you still can restore the lost data with certain data recovery tool, no matter what type of data you have lost (it could be images, contacts, videos, call logs, messages or anything else ). Android Data Recovery is one of the best third party data recovery tools in the market. It comes with the most powerful recovery engines to ensure the deleted data being fully recovered. And this software is compatible with thousands of Android devices . There could be multiple reasons behind losing data, casual mistakes, system crash, SD Card issues, problems during rooting, failed at flashing a custom ROM. This program lets you to recover all the data without experiencing any difficulties. Recoverable Data: Contacts, Text Messages, Photos, Music, Videos, Call History, WhatsApp Chat and documents. Meizu Phone: Pro 6, Pro 5, MX5, MX4, MX3, MX2, M3 Mote, M2 Note, M1 Note and others. 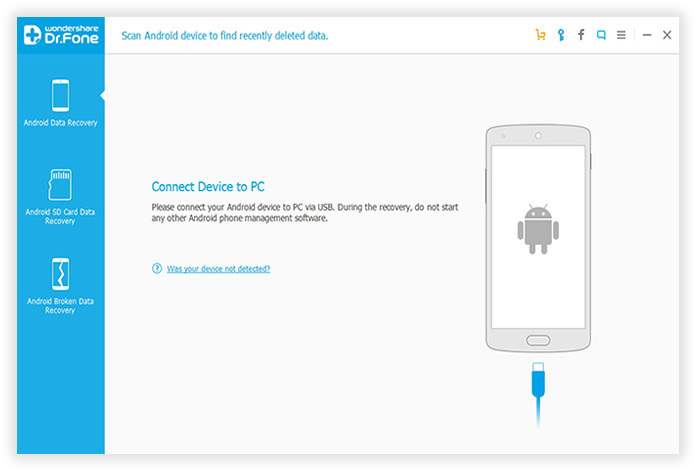 First, you need to download Android Data Recovery and install the program on your computer. Once the installation procedure is completed, open it on your computer. Then connect your phone to computer with USB cable. Make sure you have already enabled USB debugging and rooted the phone before using this program. 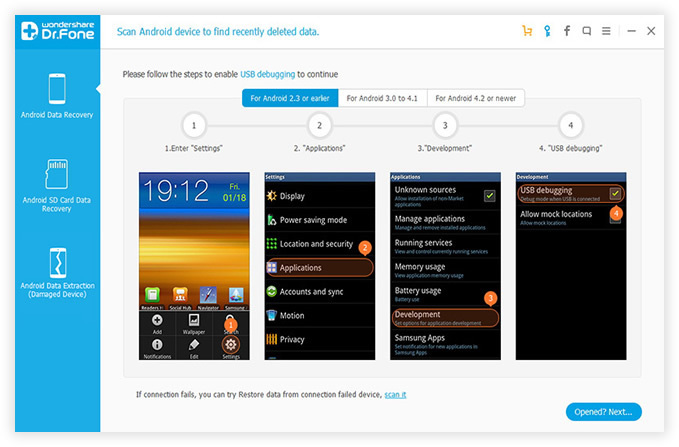 Note: you will get the "Developer Options" in the Setting and there you can easily enable "USB debugging". The pathway is Settings > Developer Options > USB Debugging. 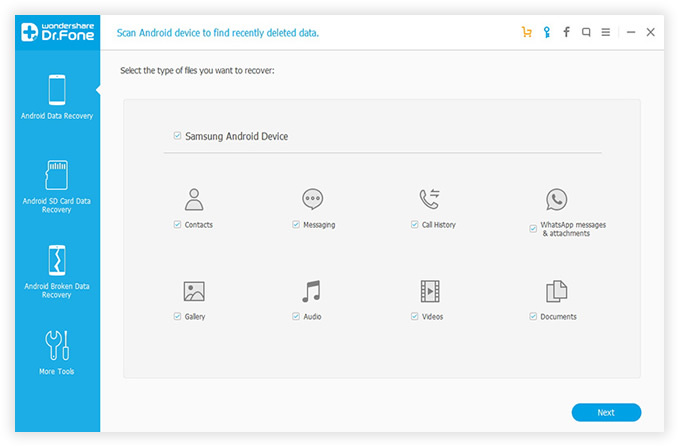 Once your device is detected by the computer, now you need to select the type of data that you would like to recover. 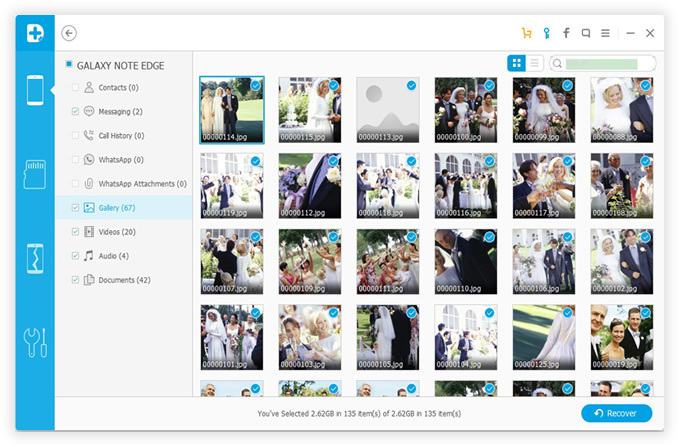 The less file type you select, the less time spending on the scanning process. And now click "Next" to select a data recovery mode. There are two data recovery modes within this program and you can select either "Standard Mode"or "Advanced Mode". It is always recommended to go for the Standard Modefirst because it is 5X faster than advanced mode. Now the software will start scanning the whole file system on the phone and find the deleted files accordingly. The entire process takes 10-15 minutes. You can preview the data one by one once the scanning process is done. All the scanned files are listed into different categories as you can see from the left sidebar. Select the items that you want to restore and click "Recover" button to save them on your on your computer. The best part of using this Meizu phone recovery software is that it allows you to verify all the data in details before recovery and it never overwritten on existing data. This powerful app provides 100% security by ensuring that only you can access your account and files. What is more, it lets you preview the files that you would like to recover so that you can recover the exact file without making any mistake and save more storage on the computer. Now enjoy using you Meizu phone without fearing about losing data any more. Note: Recovering lost data is not an easy task. So please backup your phone regularly. Then you can restore the deleted file or data in a few minutes.